Miramax Films has its Oscar hopes on "Chocolat", director Lasse Hallstrom's follow-up to his Oscar-nominated "The Cider House Rules". 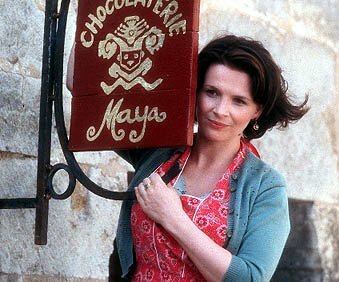 Based on the novel by Joanne Harris, "Chocolat" has already garnered four Golden Globe Award nominations, including Best Picture, Best Actress for Juliette Binoche ("Three Colors: Blue"), Best Supporting Actress for Judi Dench ("Shakespeare in Love"), and Best Score for the orchestrations by Rachel Portman (who also scored "The Cider House Rules"). Though this undemanding film certainly has a whimsical fairy-tale quality to it, it is rather frivolous compared to the director's prior effort. 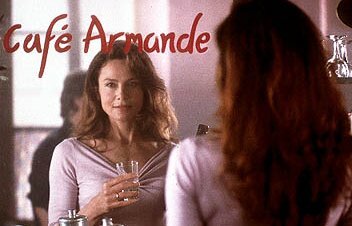 Strip away the top-notch acting talent, the quaint European setting, and the half-hearted moralizing of the script, and what you have left is an sugar-coated combination of "Like Water for Chocolate" and "Pleasantville", only bereft of meaning and insight. Once upon a time (1959, the start of Lent to be exact), a young woman and her daughter arrive in a small French village, rent a vacant patisserie, and open a chocolate shop. However, it seems that Vianne (Binoche) and Anouk Rochon (Victoire Thivisol of "Ponette") should have done some research on their target market, as the town is populated by god-fearing Christians who exercise restraint in every aspect of their lives, especially during Lent. Leading the townsfolk in their obstinate behavior is the ultra-devout mayor, Comte de Reynaud (Alfred Molina of "Magnolia"), who even edits the sermons of the town's young priest, Pere Henri (Hugh O'Connor of "The Young Poisoner's Handbook") to ensure that the messages of restraint are heard loud and clear. However, there's something magical about Vianne and Anouk. Descended from the tribes of South America and blown about by the North Wind, they drift from town to town spreading their special Mayan chocolate recipe that literally liberates the spirit of those who consume it. Slowly but surely, Vianne works her magic on the townspeople, one person at a time. Among those who are enlightened include abrasive dowager Amande Voizin (Dench) whose strained relationship with her daughter (Carrie-Anne Moss of "The Matrix") prevents her from seeing her grandson (Aurelien Parent-Koening); Guillaume Blerot (John Wood of "The Avengers") who has long carried a torch for widow Audel (Leslie Caron of "An American in Paris"); and Josephine Muscat (Lena Olin of "The Ninth Gate"), who finally works up the courage to leave her abusive husband (Peter Stormare of "Dancer in the Dark"). If you have seen "Pleasantville", then the story and themes of "Chocolat" will sound very familiar. The only difference was that "Pleasantville" did a much better job in terms of fleshing out its ideas about the challenges and consequences of both change and stagnation. The Robert Nelson Jacobs-penned script takes very few chances, preferring to stick with a predictable plot where conflict is resolved with forced changes-of-heart or gutless chocolate binges, such that everybody lives happily ever after. Instead of achieving the multi-layered and emotionally-resonant stroke of "The Cider House Rules" (which is what I'm sure he was thinking), Hallstrom ends up with a story that has the narrative complexity and thematic discernment of "Footloose". The saving grace of this otherwise staid film lies in the performances. Binoche, who earned an Oscar for her work in "The English Patient", is radiant as the film's master chocolatier, and her thesping skills are put to good use as the complexities of her character are slowly revealed. Dench is somewhat toned down from her fiery performances seen in "Shakespeare in Love" or the latest Bond films, but her presence is still welcome, while Molina does a memorable turn as Vianne's nemesis, whose growing obsession to maintain the status quo eventually gets the better of him. However, the most interesting choice in casting would have to be Moss, who has almost been indelibly associated with action films (such as "Red Planet")-- thankfully, she acquits herself quite well here. On the other hand, the casting of Depp as Vianne's love interest is somewhat questionable, as their scenes together seem to be lacking the requisite spark of passion. "Chocolat" is not necessarily a bad film... it's just that there's not too much at work beneath the surface. 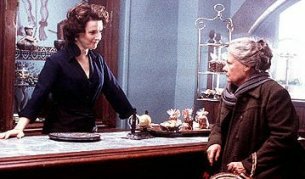 If you are in the mood for a charming and easygoing romance/comedy, then the cloying treats of "Chocolat" will probably satisfy your sweet tooth. However, if you expect a truly magnificent film on the basis of its Oscar-pedigree cast and crew, then you might be disappointed by the rather tame approach that it takes.